We believe the most useful place to start your dancing is with the Social Foxtrot (sometimes called the Social Rhythm - history). The steps you learn are easily transferable to other dances. The steps are used to music with a 4/4 beat, i.e. foxtrot, quickstep, tango. You cannot use the steps for a Waltz which has a 3/4 beat. ​In most ballroom dances the lead will start with the left foot and the follower with the right. Start the dance with the feet slightly apart with the lead weight on the right foot and the follower weight on the left foot. 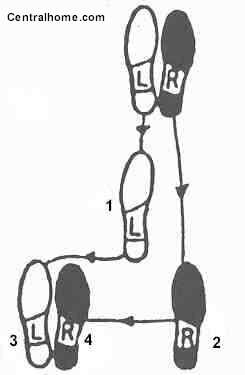 The social Foxtrot can be danced on 4 equal beats, one beat being "slow". The steps, when counted to the music would be 1. "slow", 2. "slow", 3. "slow", 4, "slow". However, you will find the music lends itself to dancing the side\close (3 and 4) as "quick", "quick". The pattern would then be Slow,Slow,Quick,Quick. ​Once the forward and back basics are practised, with the slight turns for corners, you will be able to dance round any floor. ​Remember, think of any shaped dance floor as a rectangle. As the lead will progress around the floor to their left (anti-clockwise) to travel from one line of dance to another the lead can, on the back basic, turn the "quick,quick" slightly to their left. Make the steps small or else the follower will find it difficult to keep in touch. ​Once on the new line of dance resume the forward and back basics till needing to turn to a new line of dance. Master the basics with plenty of practise before adding new steps.